(Al Ahmadi, Kuwait) – Kuwait Oil Company (KOC), a subsidiary of state-owned Kuwait Petroleum Corporation, is universally recognized as one of the world’s top oil energy producing enterprises. Pumping around 2.3 million barrels of oil per day, and controlling nearly a tenth of global oil reserves, the company is the fourth largest producer in the OPEC oil cartel. KOC’s operations under KPC’s umbrella include the exploration, drilling, and production of oil and gas within the State of Kuwait. Additionally, the company is also involved in the storage of crude oil and delivery to tankers for export. To help oversee and manage the company’s increasing oil interests KOC initiated the construction of its new headquarters at the start of 2007 in the industrial area of Ahmadi City. Ahmadi City is a private preserve in Al Ahmadi Kuwait built by KOC for its employees–complete with elegant residential buildings, parks, mosques, schools, sports centers, theaters, and many other facilities vital to any reasonable residential settlement. Designed by Gulf Consulting Group and constructed by Alimeah Building Company of Kuwait, the new KOC headquarters consist of six main office buildings and four support buildings that span across twelve acres of land. With over 600,000 square feet of conditioned space, over 15,000 physically connected points, and a total cost of over $182.5 million, the project represents one of the largest KMC Controls® installations worldwide. 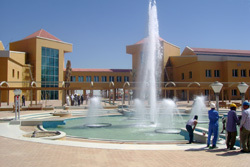 To satisfy the strict criteria for the new office complex, Kuwait Computer Services®, a local KMC Controls authorized representative, installed KMC’s latest building automation system solutions. The KMC system totally integrates the IT and BAS infrastructure which includes the facility management control system and multiple subsystems such as building management, fire alarm, and access control with closed circuit television (CCTV). Using various KMC BACnet® Advanced Application Controllers, electronic actuators, sensors, and control valves, facility engineers are able to manage approximately 1900 VAV terminals, 150 Fan Coil Units, 95 VAV air handling units, 20 CAV air handling units, primary/secondary pumping systems, and a chiller plant with five chillers and towers. As temperatures in the city can reach 115 degrees Fahrenheit for much of the year, comfortable workspace environments and mechanical control throughout the campus is critical. Further integration of over 600 lighting points, domestic water systems, the sewage management system, irrigation systems, and the fountain water system allow for better water resource management and reduced electricity demand. The fire alarm and security systems are also integrated into the FMCS to satisfy the life safety, security, and property protection requirements of KOC officials. System management is achieved through a 100Mbps Ethernet backbone integrated with the owner’s intelligent building network. This is the foundation that handles the high-speed network and its connected devices. KMC's state-of-the-art TotalControl™ web-based workstation is networked to 19 operator workstations and provides for the seamless integration of all systems information and “one click” operation for the entire graphics interface. It is possible from a FMCS workstation to control one of 176 CCTV cameras, over 100 controlled doors, or any mechanical and electrical load such as an AHU or VAV zone. As of July 2010, over 200 unique users were assigned to the system with various levels of operator access, privileges, and user capabilities. Over 2,500 employees are registered on the system allowing individual control of user workspace areas including temperature control and lighting as well as building access. Automatic scheduling with local overrides ensures that the system minimizes energy consumption but provides individual users with the freedom to control their individual workspace conditions. The integrated systems package is an ideal solution for today’s sophisticated facilities and serves as another powerful statement of how the company is committed to preserving the quality of their employee’s health, safety, and surrounding environments. 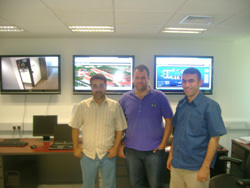 Kuwait Oil Company, in partnership with Kuwait Computer Services and KMC Controls, has set a new standard for the integration of various systems and independent protocols into a manageable and operational network.